A boozed-up motorist who had broken down by the side of the road was found to be over the drink-drive limit. Chesterfield magistrates’ court heard on February 20 how Billy Joe Brown, 25, of Thorpe Hill Drive, Heanor, had not intended to drink-drive but drove his car after a taxi had failed to turn-up and he was caught over the limit on Cromford Road, at Langley Mill. Prosecuting solicitor Ann Barrett said: “Mr Brown was seen next to his vehicle. The vehicle was stationary on the nearside of the road with its headlights and rear lights on and there were four passengers in the vehicle. “Police pulled alongside and he stated his vehicle had broken down and the keys were still in the engine but the engine was not running. Brown admitted to police that he had been drinking and he failed a roadside breath test and later registered 57 microgrammes of alcohol in 100 millilitres of breath at the police station when the limit of 35 microgrammes. 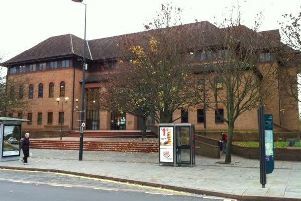 The defendant pleaded guilty to exceeding the alcohol drink-drive limit after the incident on February 12. Defence solicitor Denney Lau said Brown’s plan had ben to go out with the car but to leave it and get a taxi after he had been drinking but the taxi was at least an hour late so he made the bad decision to drive. Mr Lau added that Brown intended to drop everyone off but the car broke down and if he had just left the vehicle police would not have detected the crime. Magistrates fined Brown £350 and ordered him to pay a £35 victim surcharge and £85 costs. He was disqualified from driving for 15 months but this ban can be reduced by 16 weeks if he completes a drink-drive rehabilitation course.